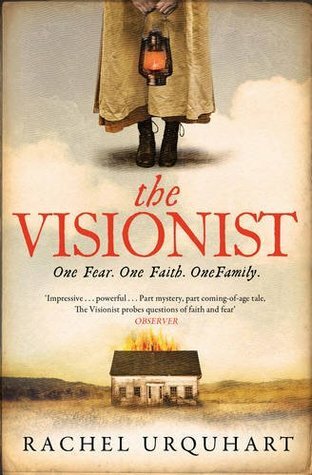 So opens The Visionist by Rachel Urquhart. Life is simple when it is only one thing, when it is all that we know. It is only when our world is broken that life becomes complicated. The simplicity of Polly’s life comes through fear of her father, Silas. He is her daily torment and she has known no other life. Her solution is also simple. In a plot point eerily reminiscent of Amity and Sorrow by Peggy Riley, Polly burns down the house and runs away with her mother and brother. They end up at the nearest Shaker community, where their mother, numb for years, leaves her children. She leaves them in a place she thinks they will be safe, but at first it is unclear why she doesn’t stay with them. It may not seem like it to Polly at that moment, but the simplicity of her mother’s wretched life has been shattered and she has her own agenda to follow. Unfortunately this agenda is only touched upon as the book goes on, and we never really get to see the full scope of the consequences of Silas’ behaviour. Our view is limited to that of Polly. Well, Polly and a man named Simon Pryor, sent to investigate the fire. He narrates his own chapters, which jar against the chapters (told in the third person) about Polly, and those narrated by her new Shaker companion Sister Charity. Simon Pryor’s chapters give us a view of life back out in the real world, and the ramifications of the fire. We also see Polly’s mother, albeit briefly and sporadically, as she deals with her new situation. But we never hear her feelings on her dead abusive husband, or the children she has more or less abandoned. She becomes a template bereaved, abused woman. Polly, on the other hand, becomes a visionist – a member of the Shaker community who is thought to have a connection with God, an ability to see and hear things straight from Him. Once left by her mother, she is expected to become a Shaker, and similarly the name of visionist is thrust upon her. But really Polly has a sort of nervous breakdown while she is with the Shakers, and her strange behaviour is seen as some kind of communion with God. However special she may seem to Sister Charity, she is a broken girl who needs to mend. But of course the simple, limited view of the Shakers does not allow them to see this. Nothing about Polly’s appearance at their community is as simple as they may perceive it to be. Rachel Urquhart is an accomplished writer, and handles the difficulties and sorrows in Polly’s life with sensitivity and intelligence; but the problem here is her story. There are the similarities to Amity and Sorrow, and beyond that there is nothing much new here. A stranger in a new community being taken for something they have made no claim to be, secrets and hurt revealing themselves over time; the power of religion and doctrine to blinker points of view. The Visionist is an enjoyable read, but does not reveal anything to its reader. I felt that it could have been so much more – and so while I am left underwhelmed by it, I look forward to what Urquhart may produce in the future. Published by Simon & Schuster (UK paperback) in September 2014. My copy was kindly provided by the publisher for review.